Bryce Harper took Boston Red Sox pitcher Joe Kelly deep with a 439-foot home run during a Nationals 4-3 loss at Nationals Park in Washington, D.C. The long ball came in the eighth inning of Monday's interleague setback. The Nationals trailed 4-2 entering the frame. [post_ads]Harper was the first batter in the bottom half of the inning. Kelly began the exchange by throwing two balls. He then gassed in a 97.6-mph fastball. Harper crushed the middle-of-the-plate offering, sending a towering blast to right field. The ball landed more than halfway up the seats in the second deck at Nationals Park for Harper's 21st home run of the season. The solo shot had an exit velocity of 112.1 mph and a launch angle of 32 degrees. Harper went 1-for-4, with a run scored, an RBI and a strikeout in the loss. 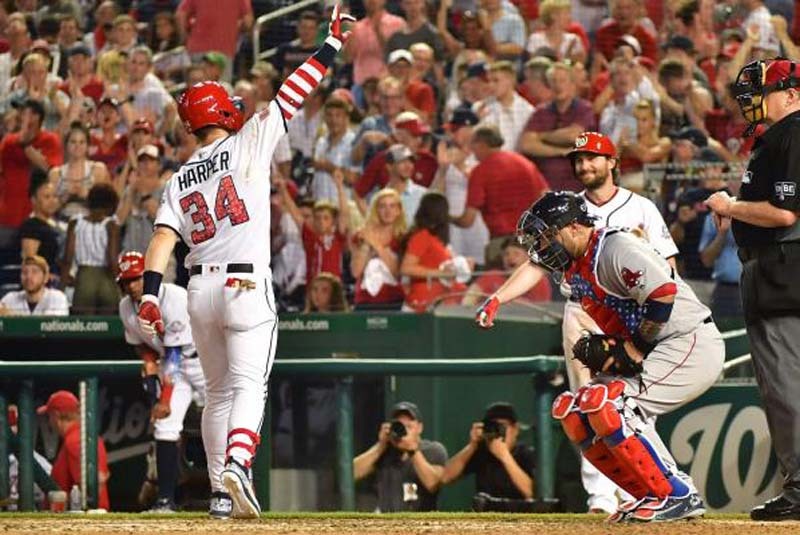 In addition to his 21 bombs, Harper is hitting .217 and has 50 RBIs for the Nationals. Anthony Rendon and Daniel Murphy also went yard for the Nationals. Mookie Betts hit his 21st home run of the season for the Red Sox. The Nationals host the Red Sox in the second game of the three-game series at 6:05 p.m. Tuesday at Nationals Park.